Superconducting nanowire single-photon detectors (SNSPDs) are significantly better at photon detection efficiency (DE) compared to their semiconducting counterparts, and have enabled many breakthrough applications in quantum information technologies. A team headed by Prof. Lixing You from Shanghai Institute of Microsystem and Information Technology (SIMIT), Chinese Academy of Sciences (CAS) have demonstrated the fabrication and operation of an NbN-SNSPD with system detection efficiency over 90 percent at 2.1 K at a wavelength of 1550 nm, which paves the way for practical application of SNSPD. 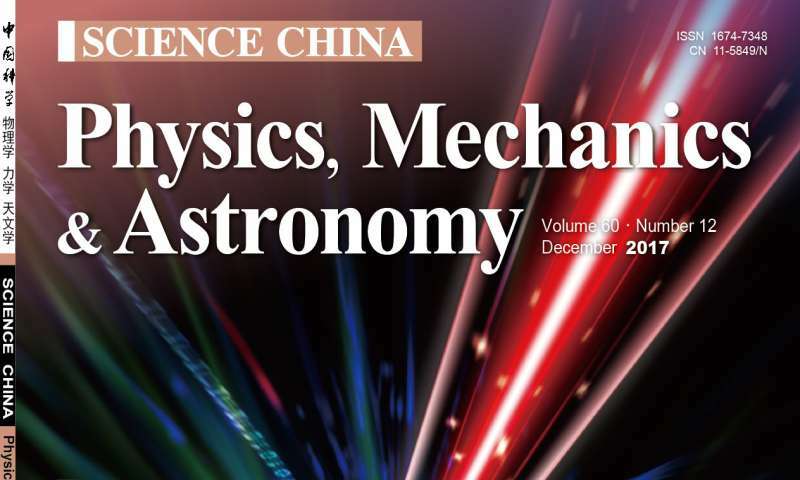 The results were published recently on Science China Physics, Mechanics & Astronomy as a cover image story. Dr. Weijun Zhang is the first author and Dr. Lixing You is the corresponding author. At 1550 nm, which is the most important wavelength for applications, the state of the art SNSPD made of WSi superconductor has reached a DE record of 93 percent, compared to InGaAs detector with DE ~30 percent. Unfortunately, WSi-SNSPD usually operates at sub-kelvin temperatures, requiring expensive, user-unfriendly refrigeration equipment. Extensive efforts have been made on the development of SNSPDs based on NbN targeted at an operating temperature above 2K, accessible to inexpensive and user-friendly compact cryocoolers. With a decade research, the detection efficiency of NbN-SNSPDs was gradually increased to ~ 80 percent. However, further improvements have proven challenging. Achieving DE over 90 percent requires the simultaneous optimization of many factors, including near-perfect optical coupling, near-perfect absorption, and near-unity intrinsic quantum efficiency. Previous attempts at achieving this have mostly resulted from a process of trial and error. This paper first reported a NbN-SNSPD system based on a G-M cryocooler with system detection efficiency over 90 percent (at dark count rate of 10 Hz) at 2.1 K at a wavelength of 1550 nm. The efficiency of the device saturates to 92 percent when the temperature is lowered to 1.8 K.
The success of this device results from an integrated distributed Bragg reflector (DBR) cavity offering near-unity detection at the interface, and through systematic optimization of the NbN nanowire's meandered geometry. The joint efforts enable researchers to simultaneously achieve the stringent requirements for coupling, absorption and intrinsic quantum efficiency. Additionally, the device exhibit timing jitters down to 79 ps, almost half that of previously reported WSi-SNSPD, promising additional advantages in applications requiring high timing precision. The devices have been applied to the quantum information frontier experiments in University of Science and Technology of China. SNSPD with near-unity detection efficiency operational on economical and user-friendly compact cryocooler will provide researchers a powerful, accessible tool, and paves the way for further breakthroughs in quantum information technology, such as optical quantum computation/simulation and quantum key distribution.